40 is NOT What I Thought It Would Be. I'm not going to lie. It happened. I turned 40. If you know me, you also know that my birthday is a BIG deal. I count down. I remind you periodically that my birthday is coming. It's typically a week before, the day of, and a week after, of celebration. When it's over, I remind you that it all starts again in just 364 more days. My routine was not even the slightest bit disrupted. This was a momentous year. One of those years you look forward to like 16, 21, 30...there was a giddiness in me and a bounce to my stride. Then, about four hours before the minute of my birth was to be reached, I heard forty screaming for me to join the "Dark Side". Even the heavy breathing, though that quite possibly could have been me reaching the top of the stairs. Suddenly my parade of celebration was a death march. My life flashed before me. I am not who I was supposed to be...not anywhere close to what that 16-year-old girl thought she would become! My to-do list still had a bucket list of crap to cross off. I remember being 17 and throwing a 40th Birthday party for my Dad. Good grief! He was ancient back then. Does this mean I, too, am ancient? The panic planted firmly in my soul, and finally, 45-minutes before the clock struck, I hit my bed hoping the world would end before I had to admit I had turned 40! I woke up to kiddos shouting, "Happy Birthday, Mom!" One look in the mirror and I realized 40 was the Second Coming of puberty as my face was a speckled face of breakouts! My five-year -old and three-year-old wanted to make me a cake. I talked them into cupcakes. As the mixer was going and I was dazed and confused as to how this 40 thing had come to be ME, my three-year-old asked, "How many is you?" Before I could answer (40 made me lethargic) my five-year-old says, "Mom is 40, Buddy." Oh, good heavens! She had said it. "Mom is 40!" It was like shards of bamboo splinters being jammed under my fingernails! Then my three-year-old exclaimed, "Oh. No! We have a problem. The store doesn't have THAT many candles!" Yes, clearly life was over. Not even the grocery store was equipped for my age. As if that wasn't enough punishment, my five-year-old, matter-of-factly adds, "The store DOES have that many candles, Little Man..."
Maybe my life wasn't over. Maybe the Grim Reaper had not yet found my youth. Then my daughter continued, "It's just that you can't light that many candles, at once, or you'll catch the house on fire. That's why we're making cupcakes, so Mom can just blow out ONE candle." Oh, gracious! It WAS true! I was of prehistoric proportions! Forty candles would catch my house on fire, if they were all lit at once! I moped around to the sounds of gleeful children celebrating my new decade. I never wanted to go leave the house again. With big blue eyes and a smile wider than the Grand Canyon, my daughter said, "Momma, we know just what you want for you birthday! 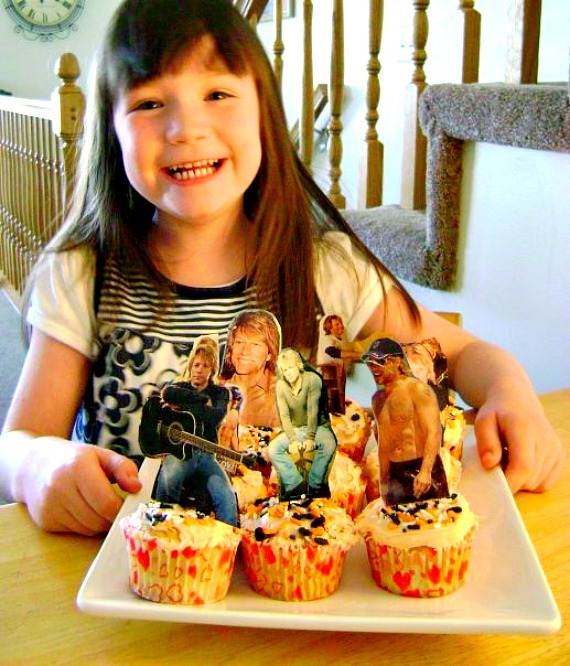 Will you cut out these pictures of Bon Jovi?" and handed me magazine pages of Jon Bon Jovi that I had been saving for years. I was torn, but cutting the magazines was easier than breaking her heart. I heard tape being yanked through the dispenser. I heard my daughter's soft voice, encouraging her brother to "tape it here" followed by, "Good job, Buddy! Mom's going to love it!" Just in case you want to see those cupcakes up close! I don't care who you are; 40 is HOT. Looking at my daughter, and this plate of cupcakes gave me pause. Forty is a lot of things. Any regrets were long before this big number I claim, hesitantly, as my age. It's hopefully a little less than half my life, and the opportunity to live life a little louder--a little more passionately! It's about a three-year-old and five-year-old who have no concept of how many 40 really is. It's about cutting out all my prized Bon Jovi pictures to create a masterpiece worthy of a Queen. It's about the smile on my daughter's face, so proud to give me "what I always wanted". I still am not thrilled about it. 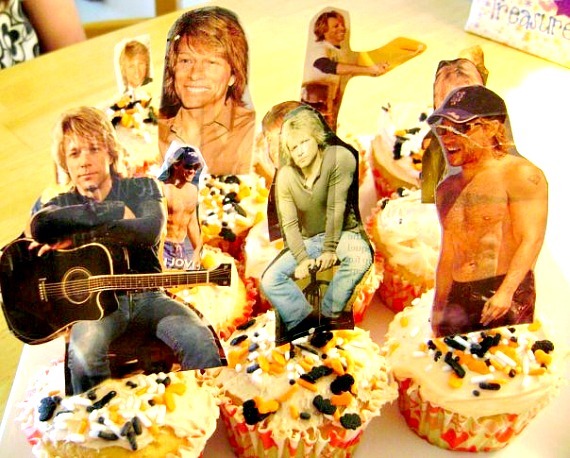 That first day in this decennium was tough, but a plate of Bon Jovi cupcakes, made with love, has made a difference in how I rock this decade!